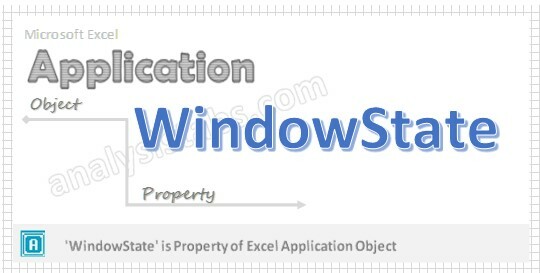 WindowState Application Property in VBA is used to returns or sets the state of the application window based on XlWindowState. Please find below more information about WindowState. Here syntax for WindowState Property of application object in VBA. Where WindowState as XlWindowState: It specifies the state of the window. Please find the XlWindowState enumeration values at the end of the chapter. In the above syntax an Application represents object and WindowState is the Property of an Application object. Please find the below example for WindowState Property of application object in excel VBA. The below example maximizes the application window. Please find the below example for WindowState Property of application object in excel VBA. The below example minimizes the application window. Please find the below example for WindowState Property of application object in excel VBA. The below example sets the application window to normal state. Step 1: Open any existing Excel Application. Step 2: Press Alt+F11 – This will open the VBA Editor. Step 3: Insert a code module from then insert menu. Step 4: Copy the above code and paste in the code module which have inserted in the above step. Step 5: Now press F5 to execute the code. Please find the below XlWindowState enumeration values and their description in the table. Where XlWindowState represents the state of the window in Excel.